Doulton water provide, healthy, natural, finest, great tasting minerals water for whole family to enjoy! The diatom ceramic shell is fitted with an activated carbon block insert containing lead removal media. Benefits: Removal of particles, pathogenic bacteria, cysts, etc. with additional chlorine, organics and lead removal capabilities. 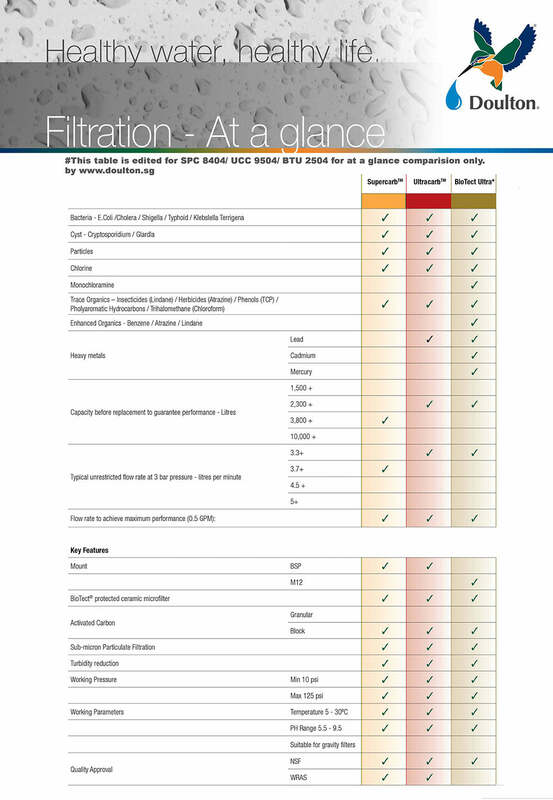 Filter Performance: Micro filtration of Bacteria, Cysts, Particles. Chlorine, Organics and Lead. Model: UCC 10" BLACK CAP! Made in: ENGLAND, fully imported. Filtration Power: 0.9 Micron Sterasyl tech! Why we should to remove Lead from drinking water? DOULTON® applying its advanced ceramic technology, using DIATOMACEOUS KIESELGUHR material to make the filter cartridge, achieve a regular porous hole size below 0.9 micron, filtrating efficiency 99.99% and capable of removing pathogenic bacteria..
Ceramics are made by 100% natural materials- diatoms. Particle of diatoms are tiny and consist in narrow gaps between particles for effectively preventing large size of it passed filters, so it can remove bacteria and harmful objects. Each cartridge is infused with silver ions to prevent the growth of bacteria on the filter media. Filter Life span: up to 2300 litres.